I sometimes like to ask musicians who sing folk songs “What is the oldest song you play?” As a person attracted to traditional English folk music at an early age, I often marveled at the gloriously old traditional ballads collected by Thomas Percy and Francis Child. There’s something interesting to me about singing not only “other people’s stories,” but very old stories at that. Turns out that they are likely not all that old. Most of them are no older than Shakespeare, and despite many antique words and usages, they are in more or less modern English. That’s old, but it’s not old like Homer, Sappho, some of the Chinese poems I’ve set to music here. Today’s piece, “Summer Is Icumen In” was nearly as old to the typical Child ballad author as Shakespeare is to us. You can say it’s words are written in English, but that’s only English within the broadest of meanings, as the words are even farther removed from the language we speak than Chaucer’s. 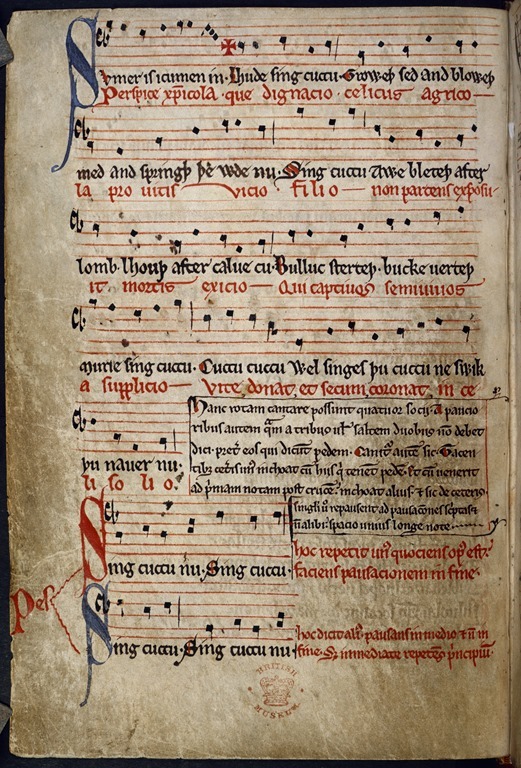 Unlike the now lost ancient Greeks’ music to accompany poetry, we even have the 13th Century music and a notated arrangement to present it sung as a canon or round. One tradition in folk music is to not be overly traditional in re-using it, and I’ve done so here. My melody is only tenuously related to that old one. The original music is minor and mine is major key, and I don’t do it as round. Furthermore, I’ve taken liberties with the various modern English translations of the words. I have replaced a phrase with one that I like better, completely blowing a raspberry toward those who translate uerteþ in the original text as “fart”. I’ve fattened up the arrangement with a goodly helping of a traditional English instrument of the antique 20th Century, the Mellotron. I told Dave Moore after I completed the mix with the new Mellotron parts that the singing wasn’t good enough for it to sound like the Beatles, and it wasn’t stately enough to remind anyone of King Crimson, and it didn’t have any undeniable pop music dynamics like the Moody Blues either—but what I may have gotten too was something in the 2000 light-years neighborhood of the Rolling Stones’ “Their Satanic Majesties Request”—which I will confess was one of the first trio of records I bought back when the Beatles “Sgt. Pepper” was threatening to reshape all pop music (a threat that was not carried forward for both good an ill). 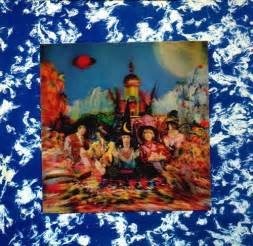 Don’t adjust your monitor, the original LP’s 3D cover is really that blurry. Also, any mention this Stones album’s name must now be done in Dana Carvey’s Church Lady voice. Anyway, I’m using digital replicas of the original Mellotron’s cranky tapes in “Summer is Icumen In,” but even in that remove they add a certain character to the string parts. Dave’s original organ part, mixed in the right channel, now seems like a top line to the Mellotron parts, but it’s a good part, so listen for it. To hear the LYL Band’s performing this old English lyric in a non-traditional way, use the traditional player that appears below.